The Doubting Believer – Now Available! “Am I really a Christian?” At one time or another, all believers encounter periods of doubt regarding the genuineness of their faith. 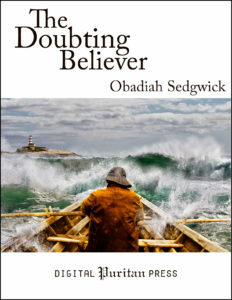 In this book, Puritan pastor Obadiah Sedgwick explores the kinds of doubt that commonly arise in the context of true saving faith, gently guiding the reader through fourteen circumstances likely to produce uncertainty. Using the Bible as a road map, the author helps us navigate away from the rocky shoals of doubt into the safe harbor of assurance. Obadiah Sedgwick (c.1600–1658) was a Presbyterian pastor and member of the Westminster Assembly. Originally published in 1641, this classic treatise has been carefully prepared to benefit a new generation of Christian readers. Archaic language has been gently modernized, and helpful footnotes have been added to aid the reader. Hundreds of Scripture references are embedded in the text (using the English Standard Version®). This edition includes a foreword by Dr. Don Kistler, a biographical preface, and review questions designed to facilitate group discussion or personal reflection. For more information, see the book description and buy links here. This entry was posted in New Releases - Books by editor. Bookmark the permalink.